Gloves with Wrist Support: Integrated 2 inch elastic Wrist support for adjustable Carpal Joint Protection. The Velcro attachment on the wrap supports your wrists and protects it from being sprained by heavy weight. Best Protection: No more calluses will be on your hands or wrists! Protects your palms from developing calluses/blisters or being tougher. The cushioned palms design will help to reduce the vibration to the palms. Humanized Half Mitts Design: Fingerless design gloves. The half mitts design provides users not only breathability but also flexibility. With humanized design, they offer you protection without limiting your movements. Anti- Slip: Won’t easily let anything slip away from your hands with non-slip palm grips. Perfectly Fit Your Hands: Our gloves are measured to fit exact to size. Users, men and women, can select your perfect gloves size according to your hands size. They will be your good companion for weightlifting, gym, shooting, boxing, paintball, pull ups and other exercises. ODOLAND weightlifting gloves are made of breathable plastic thick neoprene, making them lightweight and durable at the same time. The gloves offer users better protection in all dimensions due to the non-slip palm grips and vibration reduction design. 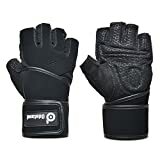 The gloves are made of humanized design, which provides a comfortable wearing for anyone loves weightlifting, gym, shooting, boxing, paintball and pull ups.